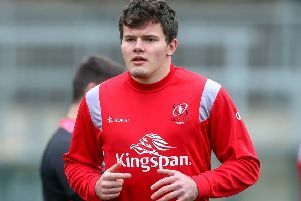 Ulster remain hopeful that Iain Henderson, Darren Cave and Marty Moore will get the all clear to play against Leinster in Saturday's European Champions Cup tie. But there was disappointing news for Louis Ludik, who will miss the quarter-final clash at the Aviva Stadium, Dublin, due to a knee injury. Ulster backs coach Dwayne Peel delivers the injury update at the weekly pre-match media briefing at Kingspan Stadium.